Our product range includes a wide range of model sapphire-with probe (pb standard), semi automatic medical oxygen gas control panel, pvc saddle - 76 mm, pvc saddle - 54mm, pvc saddle - 42mm and pvc saddle - 35mm. Flow rate exceeds the requirments of NFPA. Accepts only puritan-Bennett gas adapters. 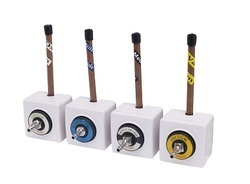 100% Pressure testing of each outlet and cleaned for Medical gas services. Indexed to eliminate interchangeability of gas service. Up to 1 '(25mm) wall thickness adjustment. 360 swivel inlet pipe foreasy installation. The Puritan Bennett standard (PB) medical gas outlet shall be manufactured by us under the brand name SAPPHIRE. 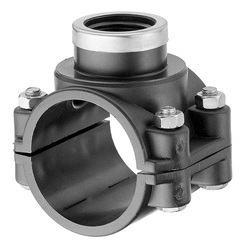 it is manufactured with a 6-1/2 (165 mm) length type K 1/2 (12.7mm) outlet diameter (3/8" nominal ) size coppper inlet pipe stub, which is silver brazed to the outlet body. The body shall be equipped with a primary and secondary check valve and the secondary check valve shall be rated at a maximum of 200 psi (1.379 kpa). In the event the primary check valve is removed for maintenace, outlets body shall be gas specific by indexing each gas service to a gas specific dual pin indixing arrangement on the receptive indentification module. We manufacture semi automatic gas control panel with manifolds. 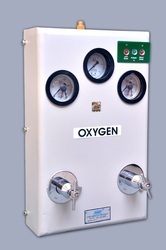 This equipment is used for checking the gas level. Fitted with control Panel, Our product are known for their ability to yield accurate results. Geometrical and dimesional connector keying according to gas used. Two-part constuction fors imple and fast separation from base block. Double locking prevents loss of gas due to leakage and for facilitating online servicing also. Gas - specific block and socket prevent any risk of false operation as interchaging of gas service and non-competent personnal mix conecting the outlet to the wrong gas source. Equipped with non-return valve for the convenient installation and servicing replacement possible without blocking the station. Push to release mechanism adaptor will automatically click back into first click lock position.Gas flow to the equipment is interrupted by pressing release ring on the fascia. Available for different kinds of installation e.g in walls, consoles bed head trunkings, ceilings of pendants. Module design minimize the number of joits where dust and bacteria can collect thus it is very esay to clean and maintain. Worldwide color-coding and lettering identifiacation for clearly indication the speicific gas. 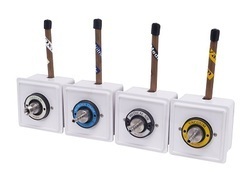 German Standard Medical Gas Outlets are designed for quick connection with no risk of gas cross connection for gas distribution in centralized areas of hospitals, dental clinics and veterinay facilties patient rooms, operating areas, surgery centers and dental offices.